Parking lots are not public space. Someone owns the parking lot, and that owner can be legally accountable if you are injured because of an unsafe condition. The law firm of Bracamontes & Vlasak, P.C., has successfully pursued compensation for parking lot injuries. With offices in San Francisco, we represent people throughout the Bay Area and Northern California. Talk to our lawyers about your possible premises liability claims. Property owners are liable for keeping their premises safe for patrons, tenants and visitors. This includes apartment complexes, businesses and shopping malls that own their adjoining parking areas, as well as entities that own or rent parking garages, surface lots and prime parking spots. Concrete parking stops, for instance, must be placed and anchored according to city code, and owners must maintain them. People are injured when they trip over curb stops in the dark, or when the bumpers break apart or move. In high crime areas or parking lots where others have been attacked, the owners have a duty to add fences, lighting, security cameras, patrols or other security presence or deterrents. 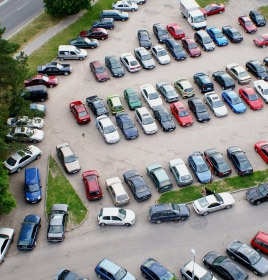 We work quickly to document the hazard, and we conduct a thorough investigation to show that the parking lot owner created or ignored a dangerous condition. Our lawyers are committed to full compensation for broken bones or facial injuries from tripping, the post-traumatic effects of an assault, or other serious injury from parking lot hazards. Contact us online or call us toll free at 415.835.6777 to schedule a free initial consultation with one of our parking lot accident attorneys.